At Rs 5,999, the HyperX Cloud Earbuds land in the high-end wired headphone category, but it lacks versatility. It definitely enhances your gaming experience for games like PUBG Mobile, but it doesn't justify the price tag when it comes to listening music and the number features it offers. 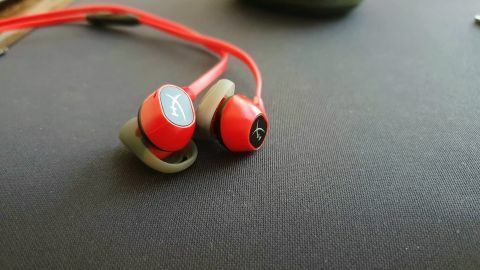 We all know that HyperX is synonymous to pro gaming, but it recently surprised us when it announced its new gaming earbuds. The company said its HyperX Cloud Earbuds are aimed specifically at Nintendo Switch users, the increasing number of smartphone gamers and you can attach them into a PS4 or Xbox One controller as well. The idea in itself sounds great for a country like India where there has been an eruption in the number of smartphone gamers in the last one year. All thanks to PUBG Mobile and the OEMs who've made smartphone capable of such intense processing. With all that happening in the smartphone world, HyperX didn't miss the opportunity of giving something that's going to be the next need of serious smartphone gamers - the earbuds. We're focusing more smartphone gamers because, in India, the number of Nintendo Switch users would be much smaller than the former. The HyperX Cloud Earbuds are wired set of in-ear headphones that come in the company's regular bright red and black color accent. The 4-foot long red cable has a flat design that prevents tangling and the 3.5mm jack has a 90-degree connector. As mentioned, these are gaming headsets but they look similar to regular headphones. Only the HyperX logo on the back of the housing is one element that gives it the feel of it. The buds, however, are not round in shape and have an Apple EarPod-like oval design. These grey colored earbud tips are removable and you get large and small tips inside the box with medium sized fitted out of the box. While it's a better earbud design for some, many like me prefer the rounded tips. These fit well in the ear and stay put, but I didn't get comfortable wearing these I constantly had a feeling that they're fitting properly and may fall off. Thankfully, they didn't fall, but I had to adjust them repeatedly while playing games. The overall design doesn't look as good as you'd expect on a Rs 6,000 gaming earbuds. Although HyperX didn't specify the material, it seems like silicone and rubber combination. The quality of the material is good. We didn't like the idea of putting a single button in-line remote though. It's a multifunction button that controls play/pause, answering calls. We missed a dedicated volume button and a microphone switch, given that it is a gaming headset. What makes it good for gaming is its lightweight nature and wired setup as it reduces latency and doesn't rely on the battery for power. Its plug and play feature makes it a better choice for gamers who want to play games remotely without worrying about the battery. Also, you get a black oval shaped, zip-up carrying case to store and carry it. It's definitely a good addition to make the earbud last longer. Also, you can carry extra ear tips in the pouch. The most impressive attribute of the HyperX Cloud Earbuds is its gaming audio for mobile gaming. I used it mostly for PUBG Mobile sessions on the Samsung Galaxy S10 and OnePlus 6T (using a Type-C converter) and the audio is impressively good for such games. You can hear footsteps, gunshots, explosions and similar sounds pretty crisply. The soundstage is great, and it does not distort even on full volumes. Mids and highs sound good, but the lows are underwhelming, which also means you'd not get the thumping bass you expect while listening to some genres of music. The microphone works just perfect for games and calls. Multiplayer games need a good mic and what I heard from my teammates is that my voice sounded great when used away from background noise. Listening to teammates on voice chat is fulfilling, more so because the heavy high mids dominate the lower mids. Note that these are single driver earbuds, and there are many better-sounding earphones in the market at its price if the music is your prime concern. The sound is generally clean, crisp and clear that can suffice basic music need, but audiophiles might not get the feeling they expect on a Rs 5,999 earbuds. But again, these are for gamers, not audiophiles. The only major issue in respect to gaming is the poor sound isolation. It fails to block the outside noise, which can only be heard when the volume isn't high. The HyperX Cloud Earbuds is a step in the right direction. It's slightly expensive for the Indian market, especially because it's dedicated to gaming and wired. If you're willing to spend Rs 5,999 on an earbud specifically for gaming, make sure the difference it makes is justifiable for the extra you spend in it. It is a more meaningful purchase for Nintendo Switch gamers than for smartphone gamers. It's not the best sounding headphone in the range for music, and it loses some of its relevance for phones that ditched 3.5mm jack. Still, if you're interested in buying the HyperX Cloud Earbuds, try getting them from the US where it costs $50 (Rs 3500 approx), which is a much logical price for them.